Who knew Lucy and Leo’s Cupcakery would take off the way it has? 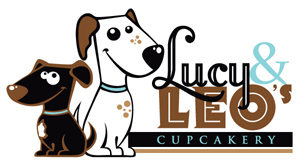 Lucy and Leo’s first appeared on the scene in early March 09, peddling their sweet little individual treats in Railroad Square and at special events around Tallahassee. In the few short months since, the ladies of Lucy and Leo’s have built themselves a cute little shop, a recognizable brand and a huge fan base. Apparently all it takes is blood, sweat, tears, flour and a lot of sugar! Now that the dust has settled (and thankfully not in the cupcakes), I figured it was time to give a shout out and a pat on the back to the best lil sweet shop in t-town. I first teamed up with the owners of Lucy and Leo’s on the development of their logo, business cards and website. Now we’re talking signage, apparel and internet marketing! If you think I work for cupcakes… you’d be correct. Chocolate cupcakes with peanut butter icing to be exact.